The Church has been important in the past years to thousands of people who passed through the doors for Baptisms, Weddings, Funerals, other services and various events. The Church has gone out toour community in times of need, in times of joy, and in times of sorrow. WILL YOU HELP advance the ministry of the Church and also the maintenance of our wonderful grade 1 listed Church building, which is at the heart of our community. The cost of running the Parish is over £5,000 per month. This does not include on-going external repairs to the recently refurbished building. Gift Day 2017 is an opportunity to express your support. Your gift may be in thanksgiving or in memory of someone. 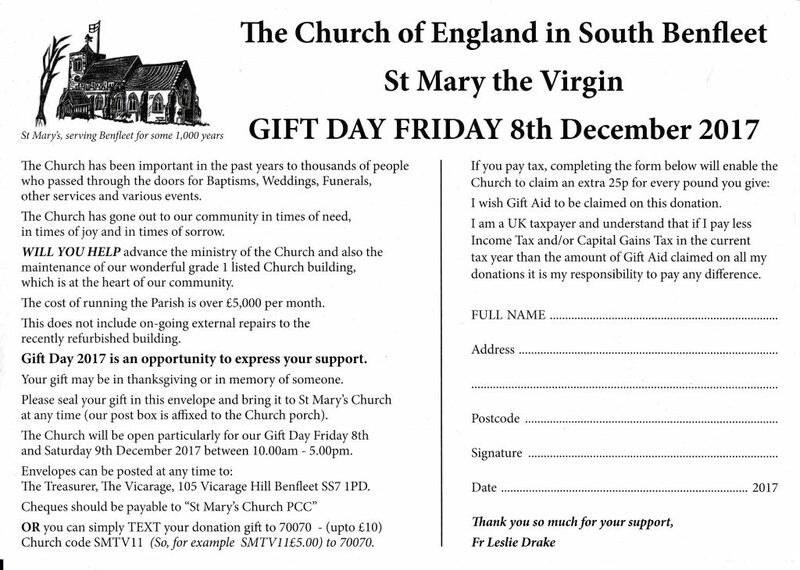 Please seal your gift in the envelope delivered to you (picture above) and bring it to St Mary’s Church at any time (our post box is affixed to the Church porch). The Church will be open particularly for our Gift Day Friday 8th and Saturday 9th December 2017 between 10am and 5pm. The Treasurer, The Vicarage, 105 Vicarage Hill, Benfleet SS7 1PD.